Skyvia is a cloud service which provides quick and easy data integration, secure cloud-to-cloud data backup with few-clicks restore and online data management via SQL. Connect and sync your Sugar data with cloud apps and relational databases, including Mailchimp, Quickbooks, Zendesk, Magento, SQL Server and many other. No coding required. 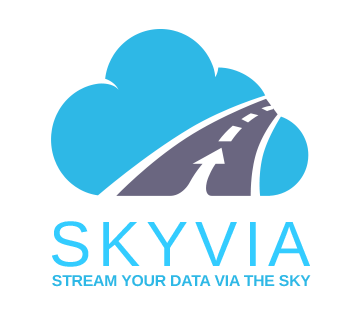 Skyvia is a free web service for cloud data integration. 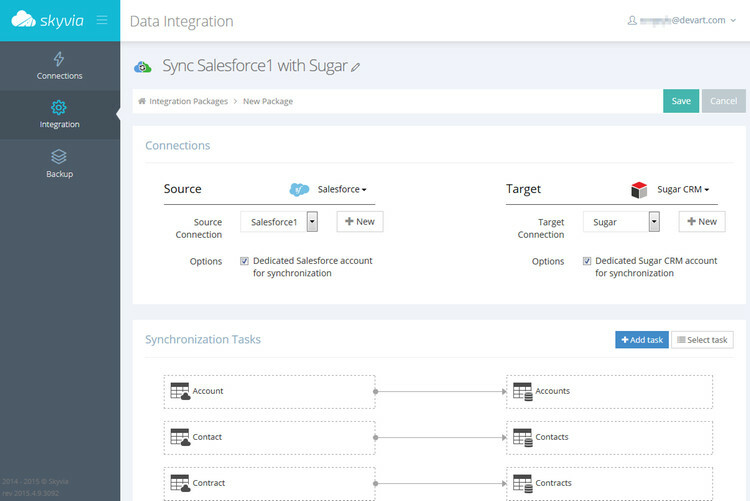 Using Skyvia, you can connect and sync your Sugar data both with cloud apps (Mailchimp, Quickbooks Online, Magento, Zendesk, Salesforce, HubSpot, Marketo, etc) and relational databases (MySQL, PostgreSQL, SQL Server, SQL Azure, Amazon RDS, etc) with ease! Using Skyvia you can automate repetitive tasks in just a few clicks without any knowledge of coding. The service enables users to perform data export, import, replication and synchronization in a unified user interface. 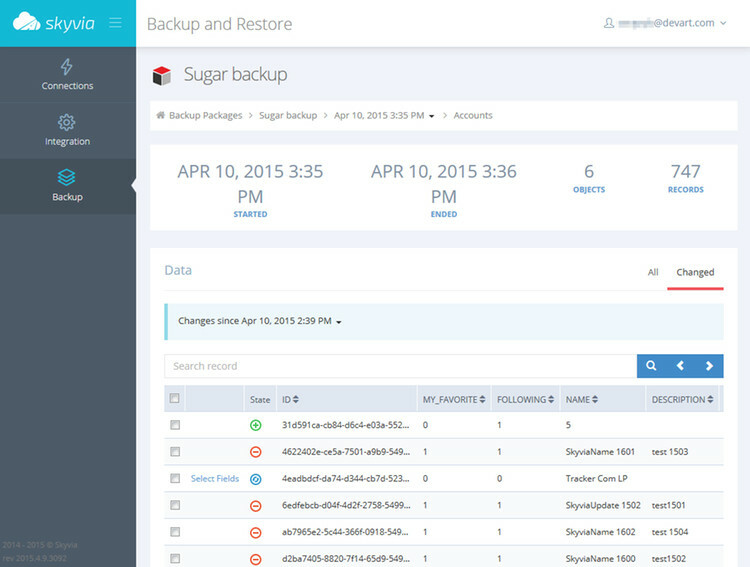 Keep your Sugar data secure with Skyvia Backup! Get automatic daily and anytime manual Sugar backup with search, view, and export of backed up data and few clicks data restore. 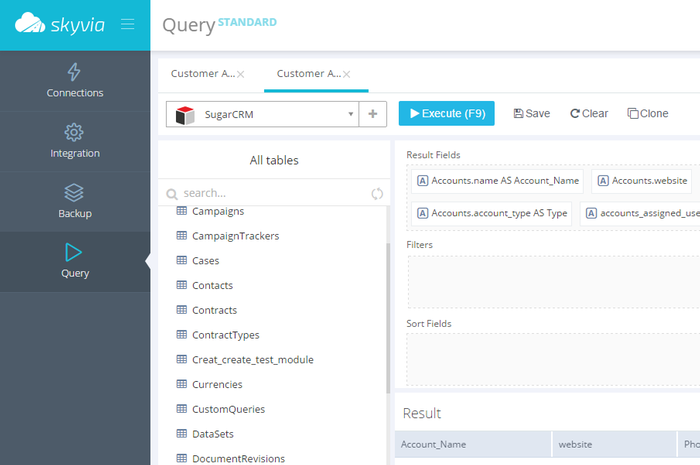 Skyvia Query enables you to access Sugar data online, visualize and manage them from the browser with the power of SQL. Create SQL queries using visual query builder without SQL knowledge, simply by drag and dropping the necessary fields. Visualize data as grid or charts to get quick insights. Get full control over your business data!